This pole is now the standard pole for most FLEX-display systems whether they are banner stands or backdrops. 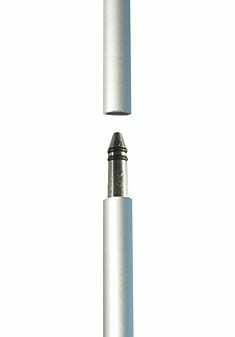 It is similar to our classic pole except it has a much wider diameter, 19mm (classic XL) versus 13mm (classic). They connect together with a simple push-fit action. This gives greater rigidity and stability in those cases where a very wide display is used on a small number of supporting bases. This pole is still very light in weight and very easy to transport. The poles are made from satin anodised aluminium and the classic XL pole is 205cm in height and is available in one, two or three sections depending upon portability required and usually dictated by graphic size. It is best suited to graphics of 200cm maximum height. It is also possible to make a 307cm pole by adding an additional female pole section to a standard 205cm 2 sectional pole where increased display height is required. All poles fit to all types of base as they share the same pin connection. The FLEX-display telescopic pole is a highly engineered solution to the problem of needing taller or variable height displays. 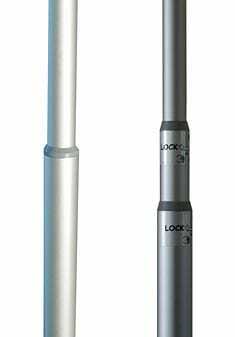 Unlike other systems which use plastic or carbon fibre, this pole is made from anodised aluminium and has a special twist/lock action that requires only the slightest of turns. As this pole has largely been replaced by the classic XL pole, this information is here for those who have older systems. The pole is still available to order if additional or replacement poles are needed. The poles are made from satin anodised aluminium in one, two or three sections depending upon portability required and usually dictated by graphic size. 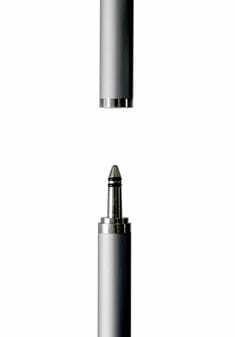 The classic pole is 205cm in height and is best suited to graphics of 200cm maximum height. The sectional poles fit together by means of a tap with rubber ‘O’ rings to ensure a tight fit.